Take advantage of CAD/CAM technologies for your laboratory in cooperation with the BEGO Scan and Design Centre and purchase customised CAD/CAM prostheses from BEGO the easy way – for a minimal scan and design fee instead of large investments*. After creating the job in the BEGO Scan and Design Centre's onlineportal, simply pack up your model and have it collected from your laboratory**. 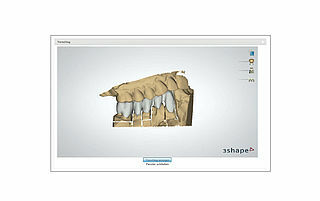 Once your model arrives in Bremen it will be scanned by us. We then model your work based on your specifications and, prior to production, allow you to check and approve the design. After you have set up your scanner accordingly and logged into the online portal of the BEGO Scan and Design Centre, you can then transmit the model scan data to us. On receipt of this data, we model your restorations and, prior to production, allow you to check and approve the design. In the Guide for BEGO scan and find Design Center you will find general information about the BEGO scan and Design Center, as well as detailed information about possible design options that we offer. We offer you the opportunity to create your jobs online and then transfer the data relating to your job via an online portal. To access the BEGO Scan and Design Centre online portal please click here. As a new customer it takes just a few steps to register for the BEGO Scan and Design Centre and you are then provided with your access details. Use these details to log on and create a new job. Then select the restoration type and use the selection fields to specify your design wishes.